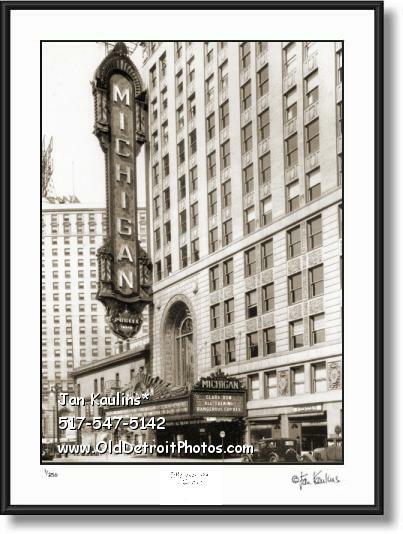 MICHIGAN THEATER MARQUEE DETROIT black and white photo picture print for sale. This sepia toned OLD DETROIT MICHIGAN THEATRE MARQUEE photo print is made from an original restored black and white historic and rare OLD MICHIGAN THEATRE photograph. In this spectacular image you can see the huge 12 story tall Michigan Theater marquee as well as the horizontal beautiful marquee over the entrance to this historic circa 1920's Detroit Michigan Theater. The old Detroit Michigan Theatre photo print picture shows the front of this historic theater at 238 Bagley at Grand River. It opened its doors in August of 1926 and was designed by architects Rapp and Rapp. It was designed in a French Baroque style. The lobby was four stories tall and many people remember it as the most beautiful of the downtown movie palaces, with ten foot chandeliers gracing the ceilings and beautiful original oil paintings throughout the lobby's immense marble columns. This beautiful sepia toned photo print was made from the original rare and historic restored black and white original photograph. It is a wonderful vintage image of this landmark historical old Michigan Theatre in Detroit in its prime.